It’s almost December – here in East Yorkshire, I still have my favourite Cerise geraniums flowering, and a lavender-blue spring clematis is blossoming. Yet this time last year we were 18 inches deep in icy snow. It’s unbelievable! But it’s not going to fool me. Oh no. 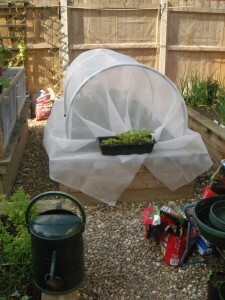 The geraniums are being packed off to the greenhouse, various forms of cloches are protecting my Swiss Chard, Celeriac, Cavolo Nero and Redbor Kale and my carrots etc. Just in case! We are ready for anything. The only real worry is that I planted my garlic in late October, it needs a bit of frost to spur it on, but some garlic cloves have sprouted to about 5 inches tall. I just hope it doesn’t suffer if we do have snow. So, now is the time for Comfort Food. I suppose we all have our special favourites – but what points us in the direction of ‘Comfort Food‘. Is it family memories – the dish your Mum made you when you were ill, or when you were a heartbroken teenager (we’ve all been there). Or the memory of coming home from school in the pouring rain in Winter, and if, like me, you wore a school tunic, you’re knees were red and stinging from the biting wind which drove the fierce rain straight at you – and your Mum took pity on you and cooked Sausage and Mash with Onion Gravy for your tea. Erik knows how to cheer me up, or reward me for working so hard by cooking his famous Macaroni Cheese. A dish to offer me so much comfort, I just love it. But he doesn’t have a recipe, he alters it every time, sometimes with broccoli and cauliflower added, sometimes with crispy bacon or pancetta, sometimes with blue cheese, but always, by special request, he puts slices of tomato on the top to gently crisp. Just writing about it makes me feel happy. But over the years, our Comfort Foods change, and I have found that by growing our own vegetables in our Kitchen Garden, vegetable dishes have found their way into our ‘Favourites’ section. I know I have mentioned Sarah Raven before, but even just by reading her seed catalogues, never mind her books, she really has opened my eyes to the use of herbs, salad leaves and different vegetables to create fabulous dishes. So over the next few days, I am going to write about vegetable dishes that will hopefully satisfy and delight you at this time of year. Cavolo Nero and Redbor Kale, Swiss Chard, Celeriac and any more I can think of. First I will write up the Recipes, for the blog, and then gradually as I make the dishes, I will add the photographs. Google doesn’t like that, you are supposed to have a photo with every Recipe, and I will do, but in time. Hope you understand. I just think it’s better to put seasonal Recipes in now to share with everyone, and then add the photo later, as I cook the dish. The other Recipes that I want to add are Christmas Recipes. I have found that preparing certain foods, and freezing them, leads to a more relaxed Christmas. So check out the Christmas section on the blog (will be starting in a day or two). So keep checking for both Comfort Food and Christmas Food. Hope you will enjoy them.